We are now in the new year. I’m so ready for you 2017! The first post of the new year is actually an outfit I forgot to post about in 2016. This was supposed to be a Fall outfit, hence, the sleeveless sweater. No way I can walk outside sleeveless this time of year. To make this outfit more appropriate for Winter, I would replace the sleeveless sweater with a striped sweater and over the knee boots. I don’t always make a resolution because honestly I forget to. I also don’t believe that just because it is a new year that you have to be a ‘new you’. I think every day and every year everyone should work on becoming a ‘better you’. I think even the most perfect people always have something to improve on. When I was doing my reflection post on 2016, I realized there are things I need to work on to make myself a better person. 1. Stay organized. I’m overall an organized person, but somehow the last few months of the year, I lost that part of me. I started to forget where I placed some of my stuff and it makes me feel like I’m running around with my head cut off. 2. Plan ahead with my blog post. Not going to lie, recently, a lot of my posts have been created the night before. Sometimes that can be stressful especially if I have a lot going on with work. 3. Don’t make plans. I tend to say ‘yes’ to a lot of things that I end up not having time for it all or time for myself or time for my husband. I end up stressing out how I will get it all done. It also didn’t help with fighting my fatigue from chemo. If anything, it has gotten a little worse and my oncologist is not happy with that. 4. Give back more. I am all about giving back and doing good. My goal is to do more of that. I am blessed with my life and there are people in this world who are less fortunate than I am. I want to be able to give something back to these people and organizations. 5. Do better at purging my clothes. I have clothes and shoes in my closet that I just don’t wear. For some reason, I have a hard time giving them up. I have this mentality that I will one day need it. There are people out there that can benefit from these clothes and it will do more good to donate the clothes to them. These are the 5 resolutions I have come up with but I am sure I will think of more. I really want to make a difference in 2017. What are your resolutions? Great tips! I love this look by the way! Happy New Year! Great style. Happy New Year. Couldn't agree more about planning ahead on blog posts, because my writing is always done the night before, too! I'm sure we can do it! Also, loving that cute little grey vest!! Happy New Year! Glad to hear I'm not the only. It has been an unnecessary stress and totally avoidable haha! Thanks Lauren! Oooh, girlfriend- I need to get better about purging old clothes, too. I have a tendency to hang onto stuff for way too long! 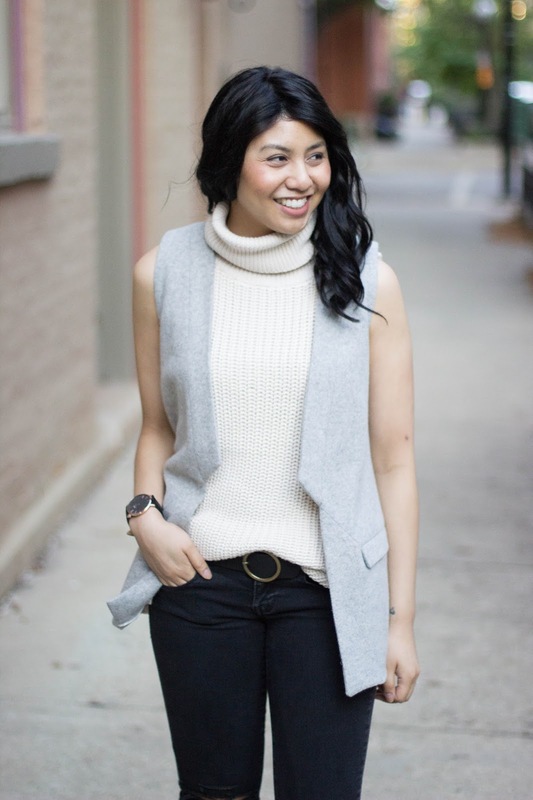 Love this gray vest + turtleneck combo! 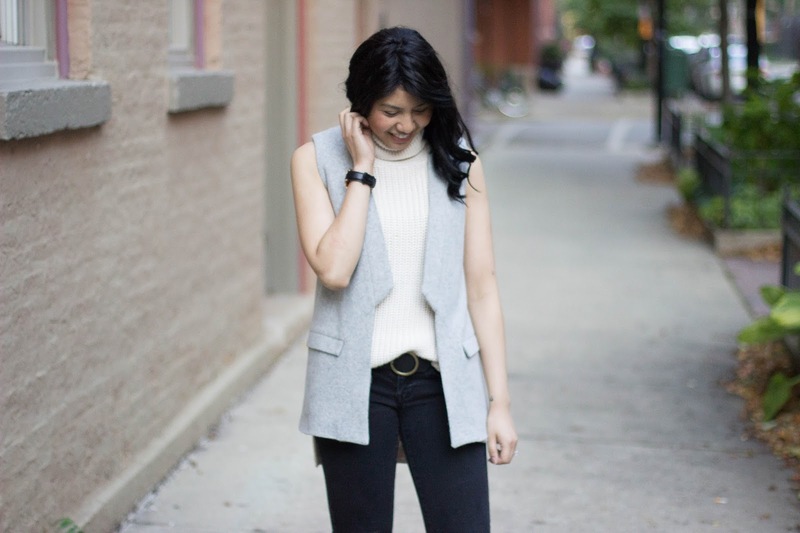 I love the vest and sleeveless sweater combo! I cleaned my closet this weekend and it was such a good feeling! Lovely outfit. I'm really loving this vest. 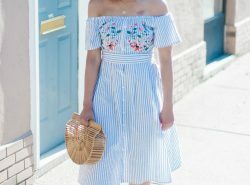 It can be added to so many different looks. Good luck with achieving all your New Year resolutions. Have the best year! Happy New Year Rach! I love the outfit! UGH – I am the same with last-minute blogging. My ideas and photos are usually done, but the actual posting never is. Here's to improving! Happy New Year Jackie! I know I am the same way too! Happy New Year girlfriend! I love the goals you're making, 2016 was the first year that I started purging my wardrobe of things I didn't need and I feel so better overall. I think we tend to get attached to things and keep them on false pretences. Happy new Year Siffat! Yes I agree with you!! Happy New Year, Rach!!!! I am so glad we connected! I wanted to tell you that you are such an inspiration and you have such a beautiful heart! Love the fact that you want to do more good! I totally hear you on that one! Also, you look lovely, as always! Love your denim! Aw thank you love!! I always love your positive outlook! Such a lovely look! I actually don't have any resolutions, because I can never keep them, haha! Glad to hear that saying no was success! It makes me feel better that it I made the right goal! 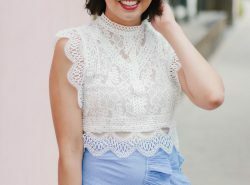 I love all of your goals <3 And this outfit is SO cute on you! Girl!! I am slowly doing a closet purge and welllllll…. I have 3 items on my floor! Hahaha cheers to 2017! Don't mind me; I'm just here to steal your awesome vest! 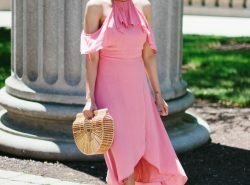 FYI, you can purge your closet and give the items away — kill two birds with one stone. That is so true! Thanks Cheryl for the idea! I love the vest and I agree with you! Good luck! Happy New Years and wonderful goals! I struggle with the same thing as you when it comes to saying "yes" to everything and bending over backwards trying to please everyone and stressing myself out in the process. It's definitely something I need to work on as well. Also, totally with you on purging clothing – I am so bad at that! I'm moving house soon so hopefully that'll get me to do a closet purge. When I moved into our home now, it did make me do a closet purge. Hence, it got me the idea to start that again. I realize I kept so many stuff I don't need! Happy new year Deborah! Love the look, the sleeveless sweater looks fab! Happy New Year! HAPPY NEW YEAR, i lovely look. Haha glad to hear I'm not the only one! I saw the first pic and though, "man it must have warmed up in Chicago." Ha. Yay for finding old pics of such a cute outfit! Love that vest. Your goals sound good too. I am on a constant quest to keep my closet organized. Omg I wish! Thanks Amy Ann! I'm the worst at planning ahead for my blog posts – I struggle between being organized and planning ahead vs only creating content when truly inspired and with genuine words flowing… Guess, I'll have to strike a balance somewhere! The balance is hard! It is so true about winter ugh! Love the sleeveless sweater and the jeans, Happy New Year! I actually just went through my closet and am planning on donating a lot of my old clothes that I no longer wear! I love your turtleneck! what a great vest! you look lovely! I love this list! I can definitely pick a few of the same that I need to work on, too. Happy new year darling! You look gorgeous, as always!! You look so wonderful. I am loving the denim. I need to get more denim jeans in my life. I need to be better at purging too. Also tend to hang on to clothes but I'm getting better. Some of my resolutions are to sleep more (haha I'm up at 2 am writing this.. fail..) and be on time! Have a great week ahead! First of all you look great. 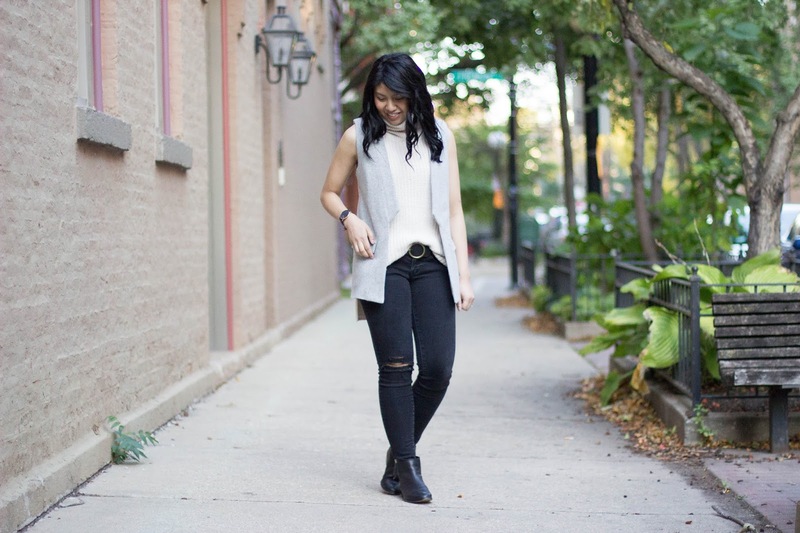 That vest is to die for and it goes so well in this neutral look. Happy 2017 Rachel and may it be healthy, first of all! I am 100% with you on 1, 2 and 5 as I resolve to do all those things too. Welcome by on Thursdays and linkup with me pretty lady. <3 Ada.